Confirmation that initial vote totals show Gruber winning by 4 points. Cobb’s team are flyspecking everything. No, wait: Gruber wins!! 675.8 To 630. UPDATE: From a teller today (as posted in the comments below): final vote Cobb 636.15 Gruber 685.80. Lots of heads put together around the head table. This is reportedly because Gruber has won, and Cobb people are trying to pick it apart. Rough numbers: 52-48 for Gruber. Results coming soon…being tabulated by head tellers from Cobb and Gruber campaigns. 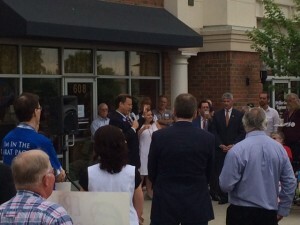 Eric Cantor and Dave Brat speaking. 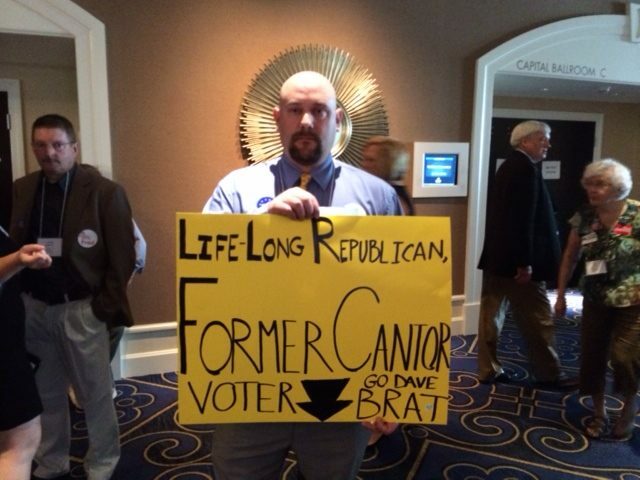 Cantor getting booed, criticizing how it’s easy to throw stones from ivory towers…he’s really, really hitting back at Brat. I’ve never seen Cantor this forceful. Angry even. IMHO, he shouldn’t get in the mud…makes him look smaller. But kudos to him for engaging in the back and forth. Folks in the crowd yelling out at him. Big boos when he tries to call Brat a liberal. This speech is going to make the papers. Voting wrapped up except for Hanover. A quick look at raw votes suggest its close, but leaning Gruber. Candidate speeches. Jamie Radtke brought down the house speaking for part of Gruber’s time. Speeches will wrap up and voting will start immediately thereafter. Linwood taking issue with assertions that the 7th came up short for the GOP ticket in 2013. This is amazing…a real close race. Could go either way. Loupassi wins temp chairman. The Cobb crowd goes wild. 672-649. Close enough that there’s still a contest. Looks like its breaking Cobb’s way. Still voting on Loupassi. Very tedious process of counting delegates row by row. Think there may be emerging consensus to re-vote if it’s close. Votes on Loupassi still being counted. Del. Jimmie Massie nominated Del. Loupassi for temporary chairman. Lots of cheering and shouting. Another nomination for Russ Moulton. Cobb ruled motion for Moulton out of order because he is from outside the 7th. Nonsense. Moulton had Cobb by the jugular, and could have slated him off the Henrico delegation, he didn’t. This is how Cobb repays him. Mark Obenshain speaking on behalf of Ed Gillespie, who is at the 11th district Convention. He got louder applause, but less sustained than Shak’s. Cobb allowing Senate candidates to speak. Huge, huge, sustained applause for Shak Hill. Gavel down. Security is insane. Finally allowed guests to enter the back of the room. Sources close to both the Cobb and Gruber campaigns are reporting their whip counts as being very, very close. They won’t really have an idea of which way things are going until registration closes in a few minutes. It looks like very heavy turnout. Just about 50/50 in terms of who is wearing Brat and Cantor stickers. So far, many more people wearing Linwood Cobb stickers than Fred Gruber’s. 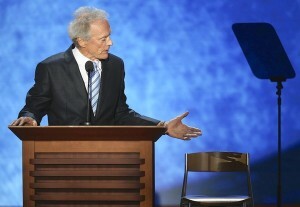 Here’s a pic of the empty chair debate/rally held by the Brat campaign earlier this morning, featuring Brat’s politically symbiotic partner, Shak Hill. The pic is a close-up, but a wider angle would have showed up to about 100 people. Inside the hotel, the lobby has filled quickly over the last half hour. Rep. Cantor is here, and is working the crowd. He is trailed by his security detail, but also by Henrico Sheriifs. These very surly deputies are visibly and unjustly suppressing speech around the Congressman. Case in point, the delegate pictured below, Paul Shaner from Louisa, was told he could not peacefully hold up his sign. I guess it’s OK to hold it down…just not up. The police warned me not to take a picture. Real nice. Hat tip to Norm at Bearing Drift. Speaking of the Dave Brat campaign, in their never-ending quest to nail down a debate with the incumbent, they intend to hold an “empty chair” debate with Brat opposing the conspicuously absent Rep. Cantor. Because all available space has been booked, the campaign made the seemingly unfortunate decision to hold the debate at a nearby Honey Baked Ham shop. My first thought was, “What? A debate in the lobby of strip mall shop?” Not exactly a choice that elevates one’s stature. Brat critics, on the other hand, were quick to pounce on another aspect: the apparent insensitivity of scheduling a debate in a pork shop against an observant Jewish opponent on the Sabbath. That does look pretty bad, until you consider that at the very same time Dave Brat will be speaking to his empty chair, Eric Cantor will be speaking to a ballroom full of Cobb delegates munching on bacon and pork sausage. Originally scheduled to be held in a high school gymnasium, the venue was later moved to the Hilton, both to accommodate the expected crowds and a turnout-generating breakfast with Congressman Cantor. The Bull Elephant has learned that all of the hotel’s meeting rooms have been booked for the event, though only a handful are needed. Despite the fact that filing fees are usually charged to help defray the costs of the Convention, thus entitling any candidate equal access to and use of the facility, we are told that Cobb’s Committee is not allowing Gruber or his supporters the use of any of the facilities (including the child care room, where delegates with young children may leave them with a baby sitter). Hotel staff have confirmed that the “convention organizer” controls all the meeting rooms, and that the lack of available space is not simply a consequence of the rooms having been rented by third parties. According to a source close to Gruber, Cobb only grudgingly allowed the Gruber campaign to have a single table near the registration area, and only conceded to that yesterday. Our sense is that Cobb and his Committee are enormously protective of Rep. Cantor, and that this lock-down of Convention facilities has more to do with keeping out any potential shenanigans from the Dave Brat campaign than it does with stifling Gruber, Cobb’s opponent. Still, this seems overboard to us, and unfair to a campaign that coughed up that large of a filing fee.